Sometimes I feel like I’m in a bit of a rut as far as our meatless dinners go. It’s so easy to fall back on pastas or my beloved risottos, and while soups are wonderful I just wanted something different yesterday. We had a bunch of kale in the crisper drawer that I wanted to use up, and a can of black eyed peas in the cupboard that I’ve had my eye on for a while, but I still wasn’t quite sure how I wanted to put the two together. Inspiration came (as it often does) from the pages of the current issue of Diner Journal. 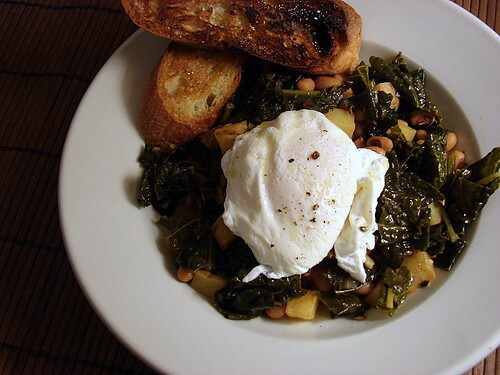 As I flipped through, I discovered a recipe for a kale and black eyed pea dish topped with a poached egg, and while I didn’t end up using that specific recipe, it was nice to know that I was on the right track as far as the combination of ingredients goes. I drained and rinsed my peas, washed and chopped my kale into about 1 inch pieces, and set them both aside. I warmed some olive oil in a pan and added half a red onion, chopped, and a bit of salt. I had a few small potatoes left from last week, so I cut them into small cubes and added them to the pan to brown, seasoning them with salt and pepper. Next came three fat garlic cloves, peeled, smashed and roughly chopped, which I sautéed until fragrant. I added a splash of white vermouth next, along with a teaspoon or so of smoked paprika and a splash of sherry vinegar, and then added the black eyed peas and kale. The whole thing got another pinch of salt and a good stir, then I lidded the pan up and let it cook until the kale wilted, about 15-20 minutes. When the kale and pea mixture was nearly finished cooking I poached my eggs, cracking each one into a ladle before lowering them into simmering water spiked with a bit of vinegar. I spooned my veggies into shallow bowls, placed an egg on top, and drizzled a little olive oil over them. They got a final topping of freshly ground black pepper, and I nestled a couple of little garlicky toasts into the bowls before serving. I think this looks amazing of course I pretty much love anything topped with a poached egg. I’m with Grant! Poached eggs make anything amazing…but this truly sounds like a spectacular dish! I like your creativity. And I reallllllly appreciate the simple instructions on how to poach an egg. I always wondered how they came out so perfectly but never knew how! Another home run! This sounds absolutely delicious, and I’m with Grant and Hillary — there’s almost nothing a poached egg doesn’t make more special. Grant – I agree! I love poached eggs and always seem to order them at restaurants, but I’ve only recently begun to make them at home. Hillary – I’m still honing my technique, but using a ladle to set the eggs into the water worked really well, much better than using a ramekin. And the texture is so much nicer than with the PoachPods I was using a while back. Amy – Thanks! There is something really luxurious about a poached egg, isn’t there? 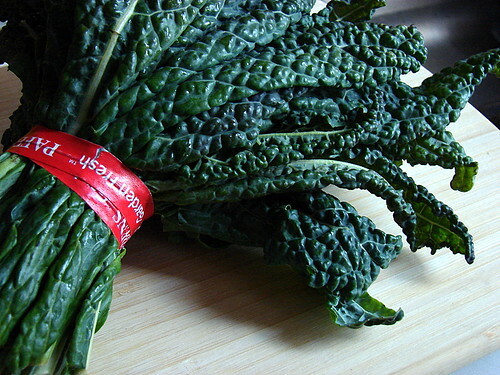 The odd thing is Dino (aka Cavalo Nero or Lacinto) Kale is one of my favorite vegetables, yet I can’t stand regular decorative Kale. Maybe I used it to garnish too many platters when I worked for the caterer? One of my mottos is… everything is better with an egg on top! This looks like a great dish. I can almost taste the slightly bitter kale, creamy peas and potatoes, all coated with egg yolk… beautiful! i can whip this one up soon! I love beans & greens! I typically use cannellini and broccoli rabe. Yum. Things with eggs on top are indeed great! I had a Wiener Schnitzel the other night with a fried egg on top. Yum! Also – the ladle is a great idea. I’ve always followed Julia Child’s instructions and used a saucer but found it very hot on my hand and difficult to manoeuver. The ladle will solve that! It looks absolutely delicious to me. I know what you mean though – if only you could keep that vibrant green of the fresh kale after it was cooked it would look so much better. erik – You know, I don’t really like the regular frilly kale as much as I do the dinosaur/lacinato variety. But I guess having one type of kale in your diet is better than none, right? Hi Chuck – I agree! 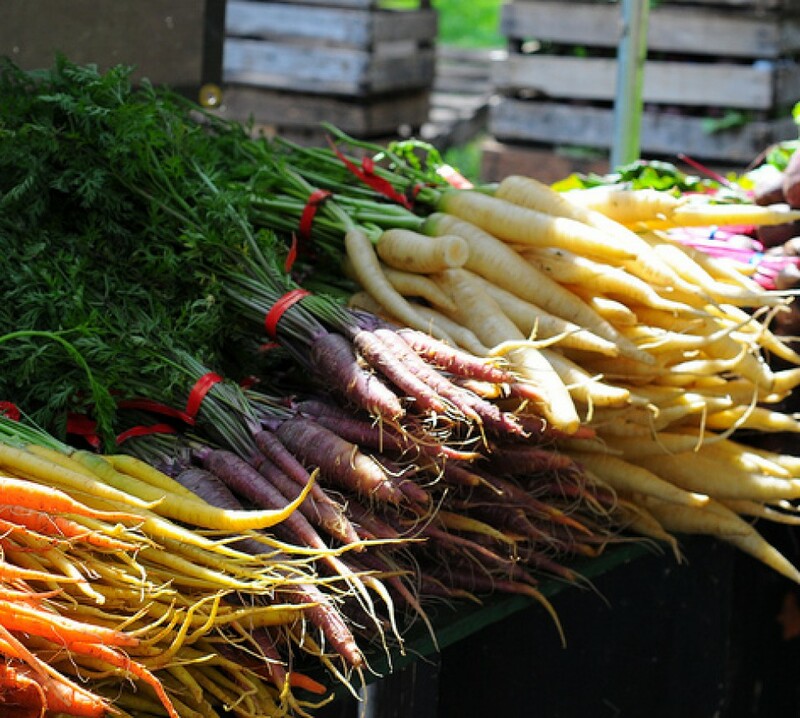 claudia – I’m surprised you don’t have kale coming out of your ears from your CSA! When you get your hands on some, give this a try. Vicki – Oh, that sounds like a great combo as well! Sara – The ladle worked beautifully – it’s going to be my go-to method for egg poaching from now on. The schnitzel with fried egg sounds yummy! Add me to the “yes on poached eggs” team. That looks delicious. I live on beans and greens and I am excited to see this creative and, I am certain, tasty dish. Keep it up, you make me happy to be one of the few New Yorkers who truly find joy in using their kitchens. Thanks, abby and sheldon! I’m actually eating the leftovers for breakfast right now with some roasted tomatillo salsa. I had an extra poached egg and I just rewarmed it in a cup of hot water at the office while the kale/beans/potatoes were in the microwave. And it actually worked!